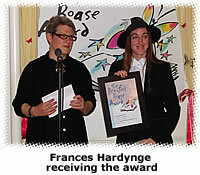 FLY BY NIGHT, a novel set in a vividly imagined alternative 18th Century, by Frances Hardinge, edited by Ruth Alltimes (also by Rebecca McNally and Marion Lloyd) and published by Macmillan Children�s Books, has won the Branford Boase Award. 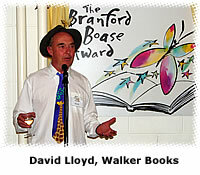 The award presentation took place last night at the offices of Walker Books. 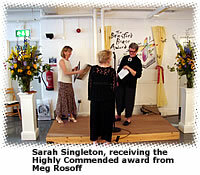 Century by Sarah Singleton, edited by Venetia Gosling (Simon & Schuster) was Highly Commended. 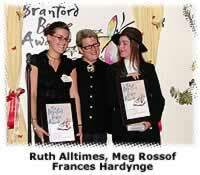 The Branford Boase Award was set up in memory of the outstanding children�s writer Henrietta Branford and Wendy Boase, Editorial Director of Walker Books. Here are some pictures from last night's Puffin audience with Rick Riordan (Percy Jackson And The Sea Monsters) and Paul Shipton (The Pig Who Saved The World). 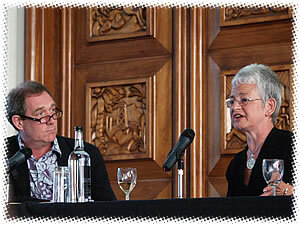 The discussion was chaired in relaxed and informal style by Amanda Craig, children's books reviewer for The Times. I did make one or two notes during the entertaining session, but my notebook has disappeared. The photos will have to suffice, except to say that I have been a Paul Shipton admirer for many years, so it was good to meet face to face at last, and that it was refreshing to hear Rick Riordan say that he missed the classroom (he was a middle school teacher in the US for fifteen years). The tale is told with such sympathy and verve that you wonder why it has taken this writer so long to do what seems most natural to her. Reminiscent of John Masefield�s classic, The Midnight Folk, this story of a brave, lonely, imaginative child is drawn by someone who retains perfect recollection of what it was like to be one. 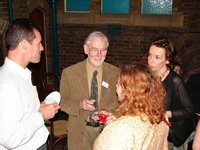 What is particularly interesting is that, where adult novelists such as Audrey Niffenegger and Liz Jensen have recently used time travel to explore romantic love, these children�s authors use it to explore the moral debt adults owe children � a challenging preoccupation that guilty parents will recognise all too well. The special nature of childhood rests on having the luxury of time, as Dylan Thomas�s great poem, Fern Hill, recognises. 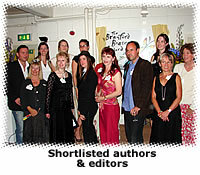 Amanda Craig is chairing one of Puffin's regular panel discussions tonight. Rick Riordan, on a rare, swift visitfrom the Sates, and Paul Shipton, will discuss the way their writing has been inspired by myths and legends. 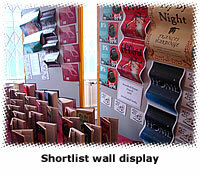 "a seething, dark-edged, amoral snake of a novel"
HarperCollins Children's Books announced [yesterday] the "Narnia ... Beyond the Wardrobe" Educator Sweepstakes. Beginning June 21, 2006 and running through January 31, 2007, the contest offers the chance for a unique behind-the-scenes look at the making of the next blockbuster film in the Narnia franchise, "The Chronicles of Narnia: Prince Caspian" from Walt Disney Pictures and Walden Media, coming to theaters in Summer 2008. This contest is open to all educational professionals ages 18 and over. 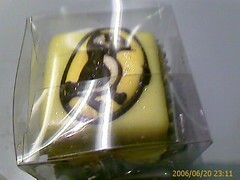 Guests at Puffin's annual summmer party - held this year at the V&A - were given small cakes on departure by flamboyantly dressed gals on stilts. Full gallery later tomorrow. Comment: cool evening, fine surroundings, good buzz. 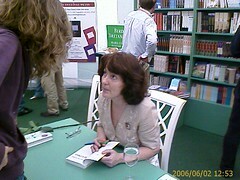 I shall never forget seeing the always elegantly turned-out Francesca Dow, Puffin MD, queueing up for Lemony Snicket (not a Puffin author) at Hay as an ordinary mum with her children. Hodder Children's Books recently held a day devoted to David Almond at Seven Stories, the Centre for Children�s Books, based in the Ouseburn Valley, Newcastle, to celebrate the paperback publication of CLAY, now shortlisted for the Carnegie and the Guardian Awards. A writing workshop began the day's activities, with clay modelling sessions in the Engine Room and readings of David's picture book - Kate, The Cat and the Moon. 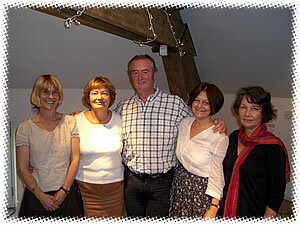 The afternoon was devoted to a schools session with an evening drinks and reading to round off the day! 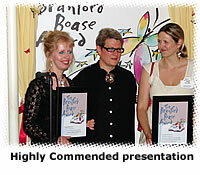 The biggest names in the children�s book industry gathered [last] Tuesday evening to bid farewell to Paula Quint, president and executive director of the Children�s Book Council, who is retiring this month after 40 years at the CBC. Several veterans who have retired from the business, including Susan Hirschman, John Keller, Jim Giblin, Eden Ross Lipson and Paulette Kaufmann, were among the many who gathered to pay tribute to Quint. Why aren't black children allowed to have any other "problem" than their colour in children's books? Why can't black children experience love, jealousy, sorrow, joy, loneliness and every other human emotion in books, without that emotion being tethered to their colour first? 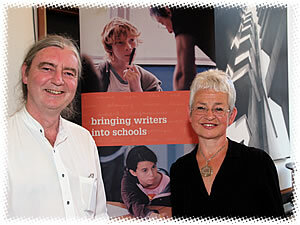 Jacqueline Wilson, Children�s Laureate with Liverpool based poet Kevin McCann, Winner of Writing Together Award for a teacher writer partnership. I really love this book: it is so good to discover a writer who does not depend on the supernatural for suspense. Kennen has taken an urban legend and turned it into a tense, funny and touching tale of how a troubled adolescent could, against extraordinary odds, gain control of his life. Gorgeously jacketed with lumpy scales and a glowing yellow eye, Beast should be a monster hit. [Hawking] plans to team up with his daughter, 35-year-old journalist and novelist Lucy Hawking, to write a children's book about the universe aimed at the same age group as the Harry Potter books. "It is a story for children, which explains the wonders of the universe," said Lucy Hawking. They did not provide further details. Prize-winning New Hampshire poet Donald Hall will be the next poet laureate of the United States. 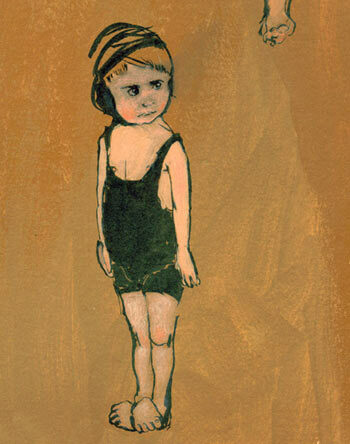 Also a writer of prose and children's books, Hall won the Caldecott Medal for his children's work Ox-Cart Man. 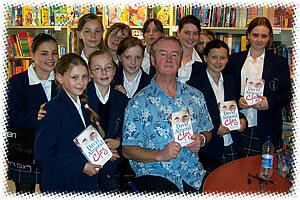 The desire of writers of adult literature to venture into children's fiction is an understandable one. The genre offers a wider palette with which to explore ideas, and Winterson has made full use of this. Tanglewreck is an ambitious project, wide-ranging and colourful, but it suffers from a lack of discipline and, more seriously, from a lack of credibility. When we first meet the Throwback Gabriel, we learn that he and his kind die if they live above ground, but in the closing chapters Gabriel reveals, without explanation, that he can live there now. 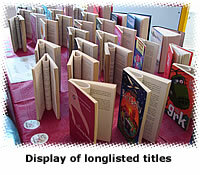 The book is full of similar short cuts. The rules that govern the imagined world are insufficiently developed, and the author feels free to change or break them on a whim. Elaborate explanations of the laws of quantum physics are expounded and then ignored, in the belief, presumably, that children won't notice. The author makes a great deal about the difference between science and magic, but in the end most of the solutions emerge out of neither, as when Gabriel is pulled from the Black Hole by "the power of love". This does a great disservice to young readers, who have as much right to expect internal logic in a book as adults do..
we should read him for enchantment, which is plentifully supplied in his peacock pie, his wind's tittle-tattle, his down-adown-derry, and even in his "winter fallen early". Children's author and illustrator Mini Grey talks to Dina Rabinovitch about the influence of childhood TV on her work and how to humiliate Action Man. 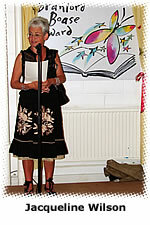 News report from last Thursday in which Pullman describes British Waterways as "the agents of industrial villainy to which this Government has devoted itself..."
Short news report about a Kate Thompson event in Lancashire - interesting for the accompanying photo of author playing out a scene from her latest novel. A 6-year-old son of a CNN worker reviews some children's books. Estrella's magical, mixed-media, dreamy images 'lead you back to the world of old story books read in childhood'. 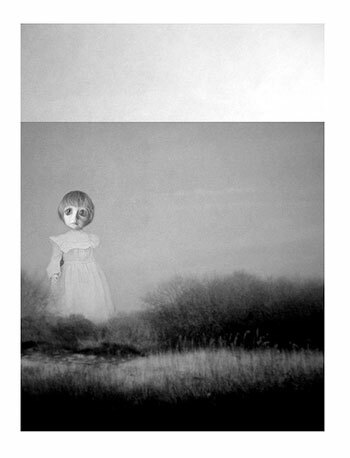 Click on the image and you will be taken to her Flickr stream. 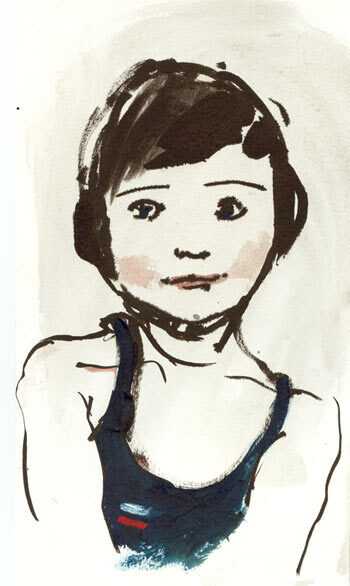 If you have a Flickr account yourself and wish to contact Estrella to discuss her work, you can use Flickr mail. Otherwise, get in touch with me. 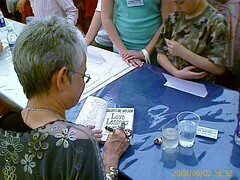 Author signing gallery from Hay. Mixed picture gallery from Hay. The winner will be announced on September 28. 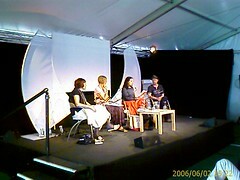 The judges are Charlie Higson, Francesca Simon and Kate Thompson, and the panel is chaired by Julia Eccleshare. Westerfield has created a gripping thriller about a dystopia founded on ideas of beauty, with all the gadgets, urban planning, moral dilemmas and medical disasters of superior science fiction. Amanda Craig on Scott Westerfield's Pretties. Her Saturday review column in The Times also included (slightly less enthusiastic) comment on Sara's Face by Melvin Burgess. 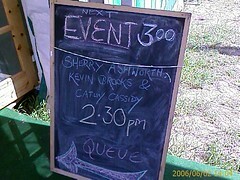 While at Hay, Sherry Ashworth spoke to me about my recent comment about my not entirely trusting Craig's taste. I said that at least there was a consistent critical viewpoint in The Times, as opposed to The Guardian, which continues to use a host of mainly peer reviewers. 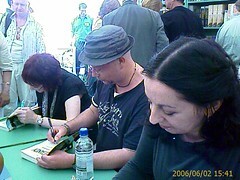 Ashworth said that, as an author, she preferred The Guardian's approach, because it made her feel that at least her kind of novel stood a chance of being reviewed in The Guardian, whereas she felt (probably correctly) that Craig is not best disposed towards her brand of fiction. I still feel very strongly that the reviewing of children's fiction deserves to be put on the same footing as, say, film reviews. In other words, a selection of recently published novels (not, as so often happens, a themed selection) should be reviewed by a regular reviewer, whose critical tastes and standpoint become familiar to readers. The Guardian Review page continues to distress me in this regard. This report page contains a couple of flash movie files, in addition to still images, so wiill take a moment or so to load. I've opened up a discussion topic on ACHUKACHAT in case anyone wishes to voice opinions about this year's venue for the Awards. Strongly represented on the shortlists, Puffin managed a complete clean sweep of this year's Red House Children's Book Awards, winning all three categories. 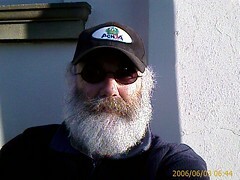 A fuller report on the event, with photos, is to follow. In the meantime, these were the winning books. 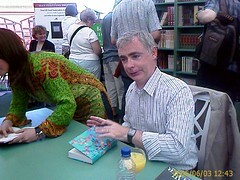 Colfer signing at the enf of his one-hour standup act, hugely entertaining for both adults & children. 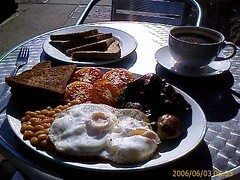 Having a cooked breakfast at the Railway Hotel, Gloucester, en route to Hay-on-Wye for the Red House Children's Book Award. Melvin Burgess attempts some social commentary about the teenage predicament. Stick to fiction, mate*. This was published in The Guardian at the weekend. It has taken me a mercifully long time to get to it. Reading it back to himself should bring a red flush to Burgess's cheeks, assuming he is capable of embarrassment. Growing things are so interesting. It should be a pleasure to review a time when we were changing so much, growing, learning so much. We have a lot to learn from teenagers about how to keep on our toes, about how to be lazy, about how to be playful, and most of all, how to just grow up. *Look forward to Melvin's autobiography of his own teenage years, though.